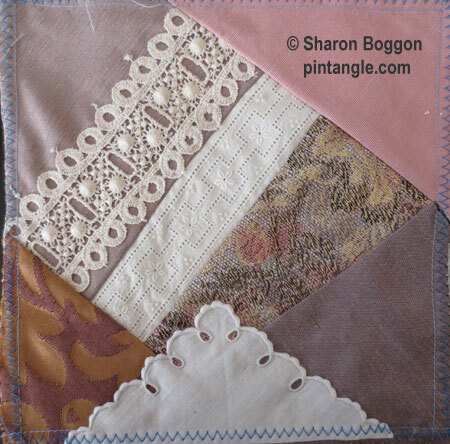 I have started block 35 in the lace crazy quilt. As you can see I have added a corner of serviette. The idea behind Work in Progress Wednesdays (WIP Wednesdays) is to encourage people to complete large and/or languishing projects. So if you are in the process of working a large project, share your progress via a blog or public photo site like flickr. The theory is, that if you regularly report publicly on a project you are more likely to pick it up and work it a little. Even if it means the project is out and ‘looking at you’ for most stitchers it means they will work it a little. This will be another gorgeous block. I am enjoying following everyone’s progress. It will be interesting to follow your work on this block. I see you have used almost no green or turquoise fabric. Will those colours be your choice for thread, beads and buttons then? I will probably add blue or green not sure yet it a case of following the mood and what threads make themselves apparent to my eye as I sort them out.